Our family just returned from our annual vacation in Ogunquit, on the southern coast of Maine. Ever since 2007, when I was pregnant with our first child and living in California, my mother’s side of the family – which includes my aunt, two cousins and their husbands, and a growing number of second cousins -- has converged upon Ogunquit for a week of beaches, lobster, and family fun. Other family members who live nearby drop in for a day, and we visit my father’s side of the family in New Hampshire on our way home. My husband and I have missed only three Maine vacations over the past decade: two because we had newborn babies, and one because we had just moved to Vermont (that year, the entire family renounced Maine and came to visit us!) This tradition is so ingrained in the pattern of our daughters’ lives that they think of it much the same way that they think about their birthdays, or Halloween, or Christmas: as something to be planned for and looked forward to all year long. This year’s week in Maine was much the same as it always is: We walked across the footbridge to get candy in Perkins Cove, jumped waves and built sandcastles on Little Beach, climbed the rocks by Nubble Light after eating mammoth ice cream cones from Dunne’s, held “Family Olympics” and a play produced by the youngest family members, and stayed in the same house where we’ve set up camp for five years. But tradition can’t stop the march of time, so our Maine vacation this year was also unique. Ogunquit 2017 was marked by the same unseasonal rain and chilly weather that we’ve experienced in Vermont: We had only three good beach days of the seven we spent in Maine, so we spent more time that usual in shops and museums. Because our children are growing up, some were less enthusiastic about dressing up as pirates for this year’s play, but I was able to have more uninterrupted conversations with other grown-ups than I can recall during any previous summer. And our annual lobster dinner was marred somewhat when our second child, a budding vegetarian, realized that her father was about to kill four lobsters on her watch, and all but chained herself to the refrigerator in protest. I couldn’t have agreed more. And, based on their comments (“I miss Vermont,” “You know, I’ll be excited to get home,” “When are we going home?”), which hit right at the three-day mark, our daughters agreed as well. I’m certain that we never felt this way during past summers. Fish and company are supposed to stink after three days, not beach vacations! What changed? What has changed for our family is that we are now more invested in where we live than ever before. We have animals that depend on us: one dog, eleven chickens, and six ducks. Making sure that these animals are well cared for while we’re away requires a great deal of coordination, and is a little heart-wrenching – especially for our girls. We have a garden to care for: vegetables, fruit bushes and trees, flowers. As any gardener knows, a July garden demands daily check-ins, and a week’s worth of neglect yields a shocking amount of weeds, nibbled leaves, and invasive insects. We have a rather large bit of land to maintain. To this end, my husband has recently acquired a walk-behind brush mower that my daughters call, “Daddy’s Second Wife.” (I am happy to yield the brush-cutting duties to her.) He spends as much free time as he has out in the fields with his brush mower, and he dreams of the attachments he might purchase for her in the future. In other words: We have attached our lives to our home in such a way as to make it increasingly difficult to leave. This might sound stifling, but for us it’s not. What we learned on vacation was that a few days (three, to be exact) during which we don’t have to wake up at dawn to feed poultry or spend hours mowing, weeding, and tending, are a nice break. But then we start to miss those duties, those things that tie us to home. Because they don’t feel like hard labor; they feel fulfilling. I’ve come to believe that the best kind of work involves caring for other living things: children, plants, animals. As it happened, my daughters provided me with an example of this kind of work during our last beach day in Maine. They’d spent all morning working with their grandparents and me to build the best sandcastle in our family’s history. It had multiple towers, a winding wall for defense, and a small village below. Because we expected the tide to come in, we built it on a rock in hopes that it would withstand the rising waters. When the waves began crashing closer to the castle, my daughters sprang into action. They gathered as many small- and medium-sized rocks as they could from the beach and built a retaining wall. 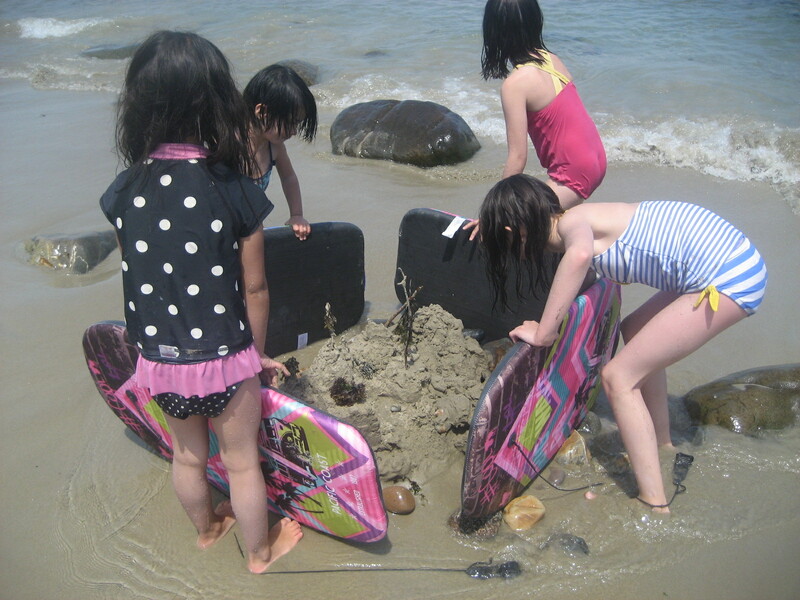 Then they supplemented the rock wall by making barriers out of their boogie boards. When the crashing surf started to wear down the wall, they decided to form themselves into a human shield and lay on top of each other in a futile attempt to hold back the water. It became clear that, despite my daughters’ best efforts, the sandcastle was doomed. Rather than cry or complain, they channeled their energy into an evacuation effort: They scooped up invisible villagers and carried them to safety. In the end, only twenty invisible sandcastle people were lost, and we gained a great story for the family history. Watching the pleasure that my daughters took in their “work,” even when things didn’t go their way, helped me to understand my own feelings about work and play. People, it seems, are made to work, and when our efforts are meaningful – when they’re undertaken on behalf of others – work can feel joyful. While we don’t plan to give up our annual week in Maine for a number of important reasons, our family learned that when work feels like play, there really can be such a thing as too much vacation. Faith Gong has worked as an elementary school teacher, a freelance photographer, and a nonprofit manager. She lives in Middlebury with her husband, four daughters, 11 chickens, six ducks, and one anxiety-prone labradoodle. In her "free time," she writes for her blog, The Pickle Patch.